Meet Ashley Abendschein, the Monroe Library’s Friend of the Month! This program recognizes students who frequently borrow a variety of library materials. Tell us about yourself: I’m from Texas, near Austin. I came to Loyola to play volleyball, but then I got injured. Since then, I’ve had time for other things and I’ve become more involved. I chose Loyola because of its small-school atmosphere and its strong academics. I’m a senior and my major is Marketing. How do you use the library? I’m constantly borrowing laptops right now because mine is getting repaired. I check out group study room keys and on the weekend, I check out DVDs. How can the library help further student success? It took me a while to realize what the library offers. As a freshman, you kind of have to step out of your comfort zone to learn what available to you. Lots of students don’t realize the extent of the resources available to them in the library, even some seniors! Thanks for using the library, Ashley! Upon returning from a vacation in Italy, I was inspired to revisit a classic film from 1953. 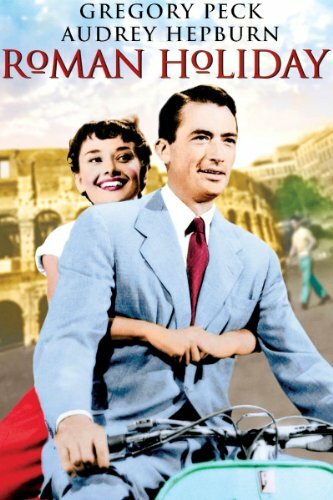 Roman Holiday follows the short-lived adventure of a runaway princess in the Eternal City. Audrey Hepburn, in her first starring role, plays Princess Ann. Hepburn’s performance earned her an Academy Award. Ann is heir to the throne of an unidentified country, and is making her way through a press tour of Europe. Frazzled by the constant and structured public appearances, she is given an injection to soothe her nerves. The princess breaks out from the embassy to begin an impromptu tour of the city while in an incoherent state. Joe Bradley, an American journalist played by Gregory Peck, reluctantly assists her. Both the princess and the reporter attempt to conceal their true identities. Ann introduces herself as Anya, a schoolgirl on the run. Joe claims to be in the fertilizer industry. However, he has already recognized his new companion as the visiting dignitary. Indebted to seemingly everyone in the city, he is eager to publish an exclusive and lucrative interview with the royal. They soon engage in a carefree tour of the city on the back of a scooter. Roman Holiday was shot entirely on location. The audience experiences the grandeur of many of the city’s famous sights, including the Coliseum, Trevi Fountain, the Spanish Steps, and the Victor Emmanuel II monument. Perhaps the most memorable scene in the movie involves the Mouth of Truth. The Church of Santa Maria has a large carving of a face whose mouth is purported to chomp off the hands of liars. Inserting a hand into the monument is problematic given the couple’s ruses. A thoroughly amusing film, Roman Holiday will make you long for a gelato or an espresso at a sidewalk café in some Italian square. You are currently browsing the Library Lagniappe blog archives for January, 2012.